Save an extra CDN$ 24.49 (61%). Buy the Kindle Edition instead. Start reading My Own Words on your Kindle in under a minute. This book is an engaging collection of writings and speeches by Justice Ginsburg that chronicle her experiences and perspectives throughout her life and career. It is not an autobiography, but in reading Justice Ginsburg's own words, you feel as though you know her afterwords. It provides valuable and informative insights into the American judicial system and the historically recent push for minority and women's rights. RBG is such an incredible person with a great herstory. This book should be mandatory reading in schools. Thanks RBG for your contribution to women’s rights. 5.0 out of 5 starsThe book is far better than the film about RBG. 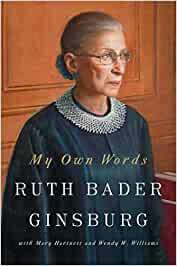 Very interesting book about a fascinating subject that is Ruth Bader Ginsburg. Highly recommend it. Placed my order yesterday and the book has arrived this noon. Amazing speed! Can’t wait to read the book.